Pictured are 17 of the 19 UD students who presented their work at the Undergraduate Research Symposium in the Chemical and Biological Sciences. 3:05 p.m., Oct. 31, 2013--Nineteen undergraduate science students from the University of Delaware presented their research on Oct. 26 at the 16th annual Undergraduate Research Symposium in the Chemical and Biological Sciences, a competition that drew nearly 200 students from 12 states. 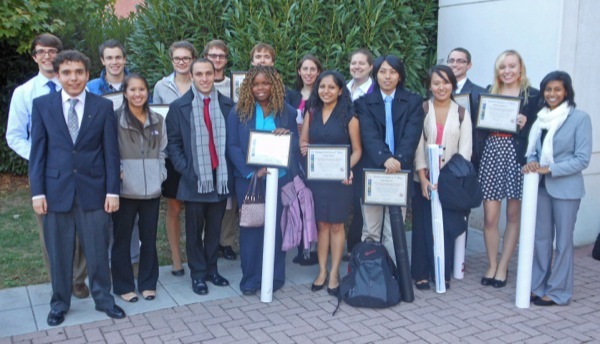 UD students competed in 14 of the 34 groupings at the symposium, held at the University of Maryland, Baltimore County, and received eight first-place and two second-place awards. White and three other faculty members  David Usher, professor, and Carlton Cooper, assistant professor, both of biological sciences, and Jacqueline Fajardo, assistant professor of chemistry and biochemistry  accompanied the students. Fanta Kalle, Biochemistry and Molecular Biology Z, Robert Akins Jr.